It’s too hot in London – so that can only mean one thing – it’s time for the Tête a Tête opera festival. This year Tête a Tête have taken over Central St Martin’s and Kings Place with three weeks of opera delights and pop up events. I went on Friday evening to Central St Martin’s to experience three opera shorts and an opera-based ‘happening’. Getting to Central St Martin’s was an experience in itself, but helpful arrows lead you through the concrete jungle that sits behind Kings Cross, across the canal, and through the alley ways of Central St Martin’s campus. Once at the front entrance there was a stall with seating, selling interesting looking food, and entertainment provided by various groups performing music and songs. Inside the foyer DrawnForth Opera were about to start their ‘happening’. ‘Whisper down the lane’ was written and composed by DrawnForth co-founder and Tête a Tête stalwart Catherine Kontz (alongside Ellan Parry). In this performance the group explored the nature of news and rumour with one person reading and singing phrases from a news paper. This information was passed down a line of people via various tubes, toy phones, a traffic cone, and other low-fi mechanisms, to Catherine at a typewriter wither bank of tuneful bells. Sometimes this would be phrases, but sometimes it degenerated into nonsense and repeated syllables. Every now and again she became frustrated with not being able to hear properly and stopped typing, standing on her chair and demanding for the words to be repeated. A delightful and thoughtful approach to opera, this was pure street theatre and made best use of the space. Following ‘Whisper down the lane’ was ‘April in the Amazon’ written by reporter Theo Merz and composed by Laurence Osborn. 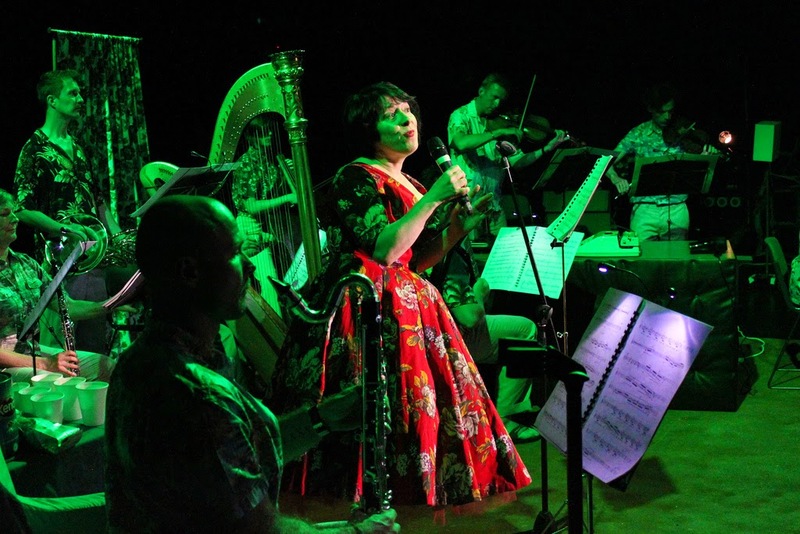 A one woman show, this featured the vocal talents of Loré Lixenberg (seen recently at Filthy Lucre) to music provided by CHROMA, conducted by Timothy Burke. Merz and Osborn made the most of their performers, and once again Lixenberg could do no wrong. Lixenberg is very much interested in the different effects a human voice can make. In this performance she used a mixture of speaking and natural singing – for which she used a microphone, and projected speaking and opera singing. All of which allowed her to vary the emotional state she was portraying, as April retold her life from life-grabbing cabaret singer, via her exploits as an explorer and how that led to a second career as a coffee merchant, to addict and mental health patient. But my favourite performance of the evening had to be ‘East O’ the sun, West o’ the moon’ by workshOPERA. 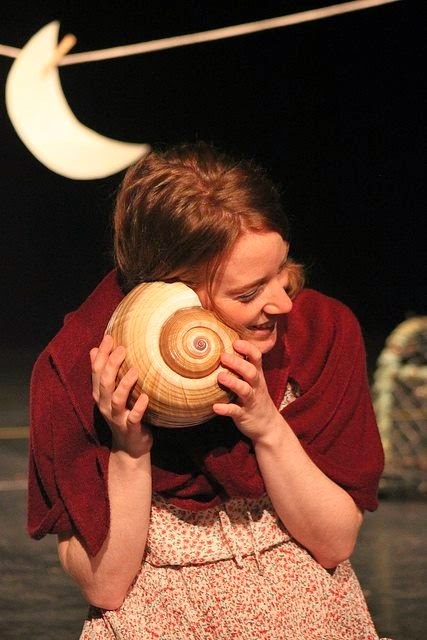 Billed as being ‘suitable for intrepid adventurers aged 8-108’ the libretto by Anna Pool told a delightful fairy story somewhere between ‘La Belle et la Bête’ and Grimms’ tales. Everything about this work was perfect from the simple set, bear costume, and puppet winds to the singing, and performances. The music composed by James Garner was smoothly contemporary and would have been at home backing a film. Themes emerged, for example supporting the bear’s appearances, and there were picturesque ‘painting’ effects driving along the action. There are really too many people to mention, and each performance was superb – balancing humour with the seriousness of their adventure. Our hero (the girl) was performed by Laura Ruhí Vidal, and it was around her that all the other action was given life. Her materialistic parents were made multifaceted by Alison Langer and Rick Zwart, and her true love, (?) the Bear, given a voice by Joseph Padfield. 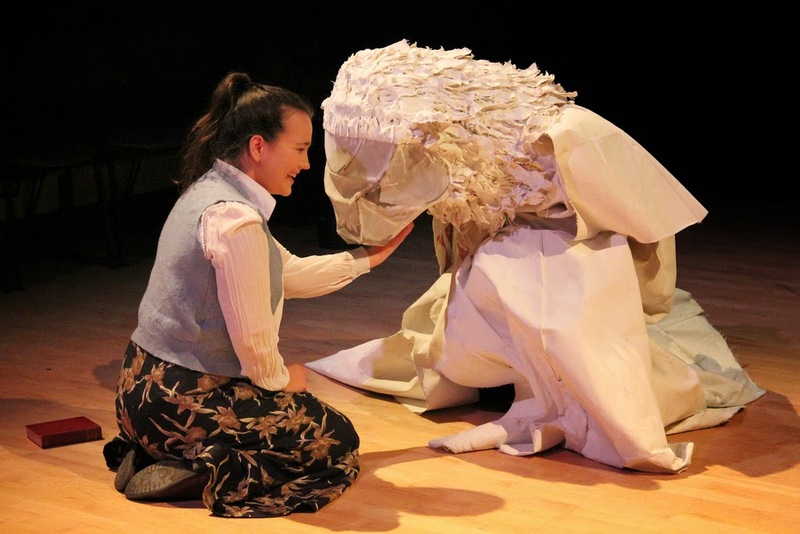 The Troll Princess, a nasty piece of work, was played with true baddy fervour by Iestyn Morris, and the Hag, with its three personalities, by Bethan Langford. After this offering I very much look forward to seeing the next thing workshOPERA produce. The final opera of the evening was ‘The fisherman’s brides’ by 19 year old Lucie Treacher. Here a set of vignettes was presented representing life in an isolated Scottish fishing village. Treacher investigated the oppression of women in the community from a lovelorn girl trying to decide who she loves best, to the old woman waiting for her husband who will clearly never return from the sea. Women chattered as they cleaned clothes, and one woman with a livid black eye tried to escape her drunk husband. Treacher had tried to go beyond typecasting, and to get a little deeper into people’s emotional states, by providing a narrative thread. Her use of Scottish musical motifs lifted the music and brought the village to life. Again the performances were great – the different voice types added to the different characterisations, and the use of the clarsach and airy percussion set a misty atmosphere. Tête a Tête runs until mid August. Providing a forum for new works and performers, this festival deserves support. There is something for everyone, from family events to those that are definitely for adult only. Tickets are under £10 per event - so it is perfect for exploration.